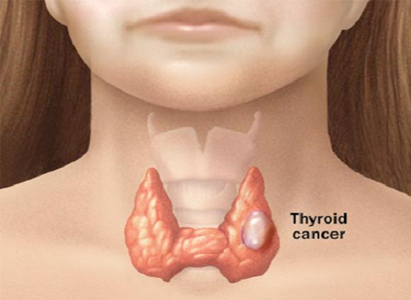 Early detection and treatment is the key to acquire better therapeutic effect of thyroid cancer. And as the incidence of thyroid cancer increases in past few years, it is important to know the symptoms of thyroid cancer. Most thyroid cancer patients do not present any obvious symptoms in early stage, but the hard and uneven lumps or nodules can be touched inside their thyroid tissues. Some patients may not develop any lumps, instead, would have the signs of metastases in neck, ribs and bones. It is possible for a patient to be diagnosed thyroid cancer if he develops nodules in thyroid when below mentioned symptoms occur. 1. Lump. Thyroid cancer, which does not present special symptoms in early stage, is inclined to develop in children and female adults. Over 95% patients who has a lump in front of neck should be alert, especially the ones developing the hard tumors that are isolated, irregular and with blurred edge and poor activity. 2. Hoarse voice. As thyroid tumor grows, it would press recurrent laryngeal nerve constantly causing hoarse voice or bucking in drinking water in thyroid. 3. Difficult breath. When a tumor develops big enough to press nerves, trachea or esophagus, can result in difficulty in breath or swallowing, radiated pain in ears and shoulders and so on. 4. Swelling lymph nodes. The tumor would encroach on lymph nodes of neck as it increases and causes swelling lymph nodes in neck. Patients of papillary adenocarcinoma of thyroid would develop the lumps that are painless and would increase gradually while patients may have hoarse voice in various degrees. This kind of thyroid cancer normally is found unintentionally by patient or doctors that its diagnosed time is later than others. What is more, it is easily mistaken as benign lesion. Papillary adenocarcinoma patients do not present the symptom of change in thyroid functions, but hyperthyreosis can occur in some patients. Majority of patients primarily have the lump of thyroid. The lump grows fast, is with blurred edge and rough surface and movable. When it encroaches on the tissues around thyroid and fixed down, then hoarse voice occurs in patients and some patients may have the symptoms of metastases. The patients of this kind of thyroid cancer mainly present the symptom of painless and hard nodules in first consultation with a doctor, besides that, they also have the symptom of local swelling lymph nodes. 1) No thyromegaly is found before onset in a large number of patients with this kind of thyroid cancer, and the progressive lump develops in the neck is hard and will grow rapidly. 2) Thyromegaly, which may accompany distant metastases. 3) A patient has been suffered from thyroid tumor for years and the tumor increases suddenly and rapidly and becomes hard. Modern Cancer Hospital Guangzhou reminds you that, as the symptoms of thyroid cancer is not obvious, once above mentioned symptoms occur, a patient should go to hospital for examination and treatments.